“Bronstein has put together one of the richest portraits there is of modern Afghanistan – complicated, conflicted, and contradictory, but always compelling." 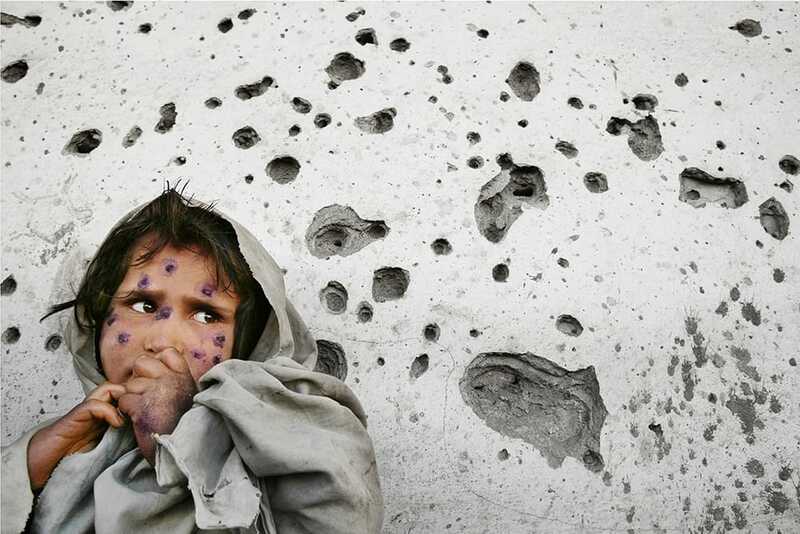 In the fall of 2001, the award-winning American photojournalist Paula Bronstein travelled to Afghanistan on assignment for Getty Images to document the U.S-led “Occupation Enduring Freedom” in the wake of the 9/11 attacks. Captivated by the indomitable resilience and spirit of the Afghan people and the rugged beauty of their country’s landscape, Bronstein has made Afghanistan her mission ever since. She has returned to the country repeatedly over the past 14 years to document the lives of the Afghan people against the backdrop of a brutal and protracted war. This remarkable and nuanced body of work is gathered together for the first time in Bronstein’s powerful new monograph Afghanistan: Between Hope and Fear (University of Texas Press, June 2016). What sets Bronstein’s photographs apart from many of her peers is her choice to spend most of her time with the Afghan people. Her work goes beyond war coverage to reveal the full complexity of daily life in what may be the most reported on, yet least understood country in the world. The result is an intimate photographic portrait of this war-torn country’s people spanning 2001-2015. With empathy born of the challenges of being a female photojournalist working in a conservative Islamic country, Bronstein gives voice to many Afghans who remain silenced by Taliban repression, particularly women and children. Represented by Getty Images Reportage, Bronstein documents the on-going challenges still facing the country today—among them, human rights abuses against women, poverty, heroin addiction and increased violence and instability—to the stirrings of new hope, including women participating in elections for the first time, education for girls, and expanded job and recreational opportunities for both men and women. Afghanistan is cited by international rights groups as one of the worst places to live if you are born female and Bronstein’s searing photographs bear this out – from her depiction of the struggle of Afghanistan’s over 2.5 million war widows many of whom are left penniless and powerless and forced to beg on the streets, to the anguish and desperation of Afghan women who practice self-immolation to escape forced marriages and domestic abuse. Bronstein counters the tough issues with positive photographs of women active at political rallies and girls engaged in learning in school classrooms. At the core of Bronstein’s work is her compassion for her subjects and her ability to gain extraordinary access to document the hope and beauty as well as the harsh realities of their lives. She is relentless in her pursuit of stories she believes must be shared with the world, and she goes after them, sometimes at great personal risk. In her introduction, fellow award-winning journalist Christina Lamb describes the gains that Afghan women have made since the overthrow of the Taliban, as well as the daunting obstacles they still face, and Kim Barker, a staff reporter for The New York Times, writes the foreword. Afghanistan: Between Hope and Fear is an eloquent portrait of everyday life and a story about the legacy of America’s longest war. This important and beautiful volume is the most complete visual narrative history of the country currently in print. With over 30 years in the news business, Paula Bronstein is one of America’s most distinguished female photojournalists. She has won numerous awards, among them: Pictures of the Year International; National Press Photographers Association (Runner up: “Photographer Of The Year”); The Pulitzer Prize (Finalist: “Breaking News”); The Overseas Press Club of America (John Faber Award); Foreign Correspondents Club: Thailand (“Asia Photographer of the Year”); Leica Oskar Barnack Award (Finalist); and China International Press Photo (“Photo Of The Year”). Her work has been featured in numerous individual and group exhibitions including “Afghanistan’s Health Crisis,” Lido, Italy (October 2015) and the Annenberg Space for Photography, Los Angeles (December 13, 2014 – May 3, 2015); “Women in War” at the 2014 Korea Photo Biennale; and “Women Between Peace and War – Afghanistan,” which traveled to New York, Miami, Denver, Chicago, Washington D.C., Philadelphia, Los Angeles, and San Francisco. Other venues include War Photo Limited in Dubrovnik – “Women War Photographers,” Visa Pour L’Image, Perpignan, France (2008), The Fence an outdoor Photography Exhibition – Photoville, New York (2014).